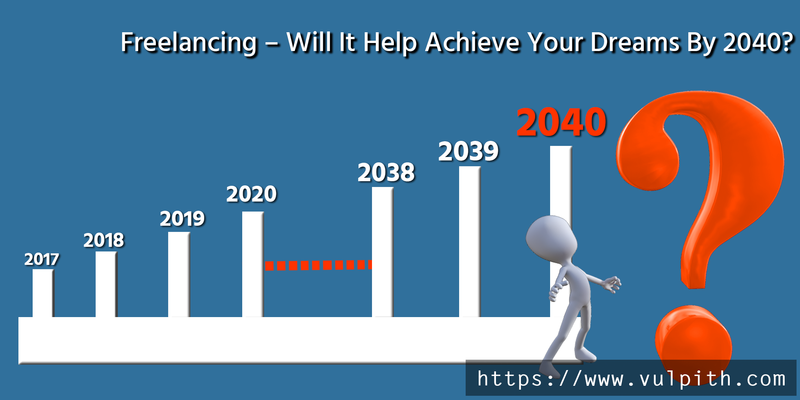 Freelancing – Will It Help Achieve Your Dreams By 2040? Yes, I know 2040 is too far away. Everyone talks about 2020 and 2025, which in my opinion is not good enough for a fair estimate. To understand where you fit in and, to answer if you can achieve your life goals as a freelancer, let us take understand certain trends that indicate lucrative freelancing. Everyone is aware that the American economy is a major driving force behind the freelance economy of today. It is fair to estimate that the freelance industry will be highly influenced by the direction that the economy takes. Having said that let us look at which way it is headed. Once the reduction of payroll taxes reaches a critical stage, the American fiscal system will be critically challenged unless the policies are amended drastically. The report was created with some unique and critical insights from over 30 policy makers, economists, and technologists and is focused on four major areas – future of inequality, future of work, future of entrepreneurship and future of technology. a. The breakup of work culture: An average American was always of the idea that a job meant success and security. In fact, that is the belief, across the world, today. Today, with the recent recession and the hardships that came with it, the same American has come to realize that having a good job does not translate into a good economy or for that matter, job security. As you can well foresee, the American thought process is undergoing a sea of change. I think, there will be fewer employer-employee relationships and more people will be employed in their own businesses built on freelancing. In which case, most job demand will come from small businesses, unlike today. b. Wages will rise: Growth of small businesses means an increase in wages. Self-employment will obviously lead to improved earnings and talent will come with better wages. In the American economy, wages will get a shot in the arm owing to the negative demographic growth rate. This will translate to better wages for immigrants too, that is if the world does not forget geographical barriers by then. c. Talent Hunt: It is foreseen that there will more and more talent agencies looking for professionals. These agencies will refine themselves and will not limit themselves to hunting for athletes and artists as they do today. Though there is no clear pre-defined path as to how the new economy will evolve, it is easily foreseen that the new economy will have a bigger spread of talent requirement compared to today. With more small businesses, the number of new platforms will grow exponentially and the required talent will also spread with it. As you can see, life is only going to get better and better for you as a freelancer. The economic shift that is already underway will make freelancing more lucrative than it is. And expectedly, the world will follow the trend. It is time you braced and planned for the smart ride ahead.